Elite is a line of home use appliances manufactured by Kenmore and sold exclusively through Sears. Products in the line include microwaves, dishwashers, water softeners, gas grills, food processors, water filters, and washers and dryers. Most of these appliances don't exhibit error messages for lack of an interactive display menu. However, a handful of Kenmore Elite products do display warning codes for users, which at times can be very cryptic, given their abbreviated nature. If F-variable error codes such as F1 and F2 are displayed, users should call Kenmore for assistance. Error code HC occurs on Kenmore Elite Oasis domestic washing machine model numbers 110.2703, 110.2704, 110.2705 and 110.2715. The error code indicates that the hot and cold inlet hoses have been reversed, meaning that the washer is receiving hot water when it needs cold and vice versa. Error code HC only has occasion to present when a washer has been improperly installed. 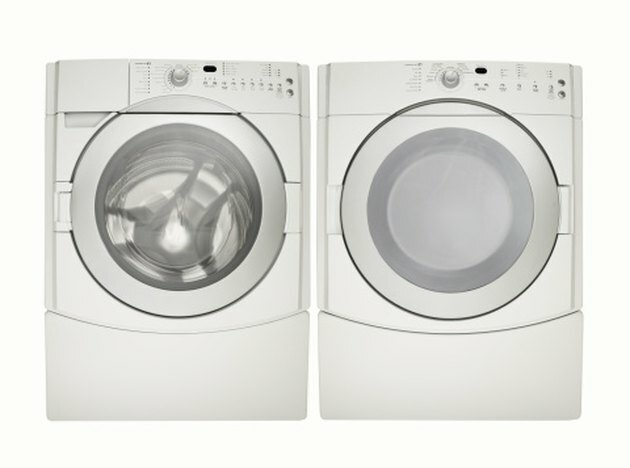 Rectifying this problem is matter of turning the washer off, detaching the inlet hoses and connecting them to the opposite inputs. Error code PF presents on Kenmore Elite HE3 residential dryers model numbers 10114657, 11087872601 and 11087872600. The code means that a power failure has occurred. If a Kenmore Elite dryer suddenly stops working in the midst of a cycle, a power failure is a probably cause of this stoppage. The HE3 dryer manual recommends holding down the "Start" button to restart the unit in the event of a PF error code. If this does not work, users should check to insure that that dryer is in fact plugged in and that the outlet to which the dryer is connected is receiving electricity properly. Error code ERROR 1 presents on Kenmore Elite countertop microwaves with model numbers 56561582011, 16755, 56561584011 or 56561589011. ERROR 1 occurs when the unit has not received enough power to undertake a sensor cooking operation. Sensor cooking is a feature of Kenmore Elite microwaves that adjusts the temperature and cook time of dishes contingent upon information received by sensors in the microwave. In order to perform this function, a microwave must be plugged into a power source for at least five minutes previous to doing so. Thus, ERROR 1 indicates that the unit has not been plugged in for a sufficient length of time.